What are Rubber Expansion Joints? Rubber Expansion Joints are defined as connectors between vessels or used in all systems transporting fluids, slurries or gases operating under pressure at widely different temperatures. These rubber expansion joints are installed in air and gas duct systems in all power plants, gas turbine systems, diesel engine installations, petrochemical and chemical plants, pump systems, cement works, steel works, incinerators, on- and offshore systems, ships and cruise vessels, etc. Rubber expansion joints are used in a variety of heating, ventilation, and air conditioning systems, which includes commercial and industrial buildings, hotels, apartments, schools, shopping plazas and aboard ships to relieve stress in ductwork. 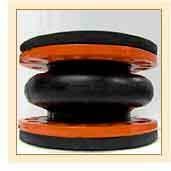 Rubber expansion joints are installed to isolate equipment like pumps, compressors and chillers from the piping system. A variety of configurations of joints are available accommodating different shapes, service and connection requirements. Protection of a process piping system is an important use for rubber expansion joints. The joints reduce noise and vibration caused by forces in pumps. They also centrifuges by behaving as a shock absorber in systems handling abrasive slurries, corrosive chemicals, or very reactive liquids or gases. Thermal movement in a piping system can also be avoided by using rubber joints. The excellent chemical resistance of rubber and synthetic elastomers make these joints ideal for process piping systems. Nuclear and fossil fuel plants use Rubber expansion joints so as to reduce thermal expansion and contraction on condenser lines, condensate lines, steam turbine exhaust lines, aeration systems and cooling water lines. Reliability, large size capability, long life, and the ease with which they accommodate themselves to movements make these expansion joints ideal for power plant applications. Rubber expansion joints have been installed in demanding industrial ducting systems where there are problems like heavy vibration, dry or wet corrosive materials, flutter etc. Eliminating the destructiveness of electrolysis and at the same time insulating against the transmission of sound, rubber expansion joints allow the necessary motion and flexibility in a 'moving' ship's piping system. The compactness, resilience and low stress features of rubber make these joints ideally suited for shipboard piping systems. The rubber joints are popularly used in areas like auxiliary condenser, air intake on diesel engines, overboard discharge line between condenser and hull, ventilation lines, flush and sanitary systems, fire and bilge pumps, to name a few. Water treatment plants, waster water treatment plants, Sewage treatment plants, and air scrubber systems all employ the use of rubber expansion joints. Due to their resistance to abrasion and corrosion as well as their flexibility feature, rubber expansion joints are ideal to be used in raw and secondary sewage lines, sludge pumps, centrifugal air blowers, scrub stacks.